There was definitely a whole different vibe. Which is impressive when you're talking about a show with a specific formula that's been on the air for fourteen seasons. With Dean gone, Sam has taken that final step into adulthood – growing a beard. No, I'm kidding. Sam is finally the boss, and wow, he's good at it. Sam in charge is much like Dean in charge, but with a bit more deep thought and fewer cheeseburgers. It's a good look for him. I didn't expect Kip to survive the episode and he didn't, even though he was relatively good fun with interesting mannerisms and elocution as well as an oft-mentioned addiction to the taste of human flesh. (I think the fact that the demons had taken over a barbecue restaurant was supposed to be funny in a cannibalistic way.) A veteran of Genghis Khan's armies, Kip had spent the last six centuries Destroying, Drinking and Defiling (the three Ds), and his earlier encounter with Archangel Michael made him aspire to Hell's kingship. 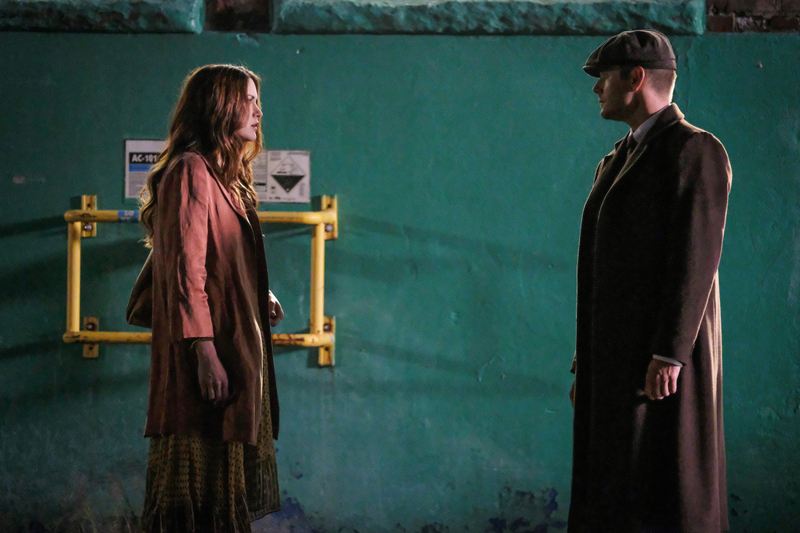 He was also enamored of Crowley's unusual relationship with the Winchesters, but he was no match for Sam. Kip my boy, as Sam might have mentioned, you're no Crowley. But hey, the battle in the bar was very cool. Mary and Bobby came in shooting – Mary in particular looked like an action hero – and Sam's plan with the hidden demon knife actually worked out. Sam even talked the other demons out of sticking around. Impressive. With all due respect to the awesome Jared Padalecki who did excellent work in this episode, I've always thought that Jensen Ackles was the stronger actor of the two. And Archangel Michael did indeed feel like an entirely different person, even though part of me kept enjoying a clean-shaved and impeccably groomed Jensen in gorgeous clothes. Michael has apparently rethought the human genocide he carried out in Giant Litter Box World and is going to make our home a better world by "doing it right this time," whatever that means. He researched his new plan by asking all sorts of beings, "What do you want?" It's interesting that one of those beings was Sister Jo a.k.a. Anael, who acts as if she's all about healing for money and acquiring designer fashions but whom Michael says deep down wants love, a home and a family. Why did Michael let her go so that she could call Sam? And why has Michael chosen a vampire for whatever it is he has planned? Honestly, though, I really miss Dean. Is he even conscious in there somewhere? 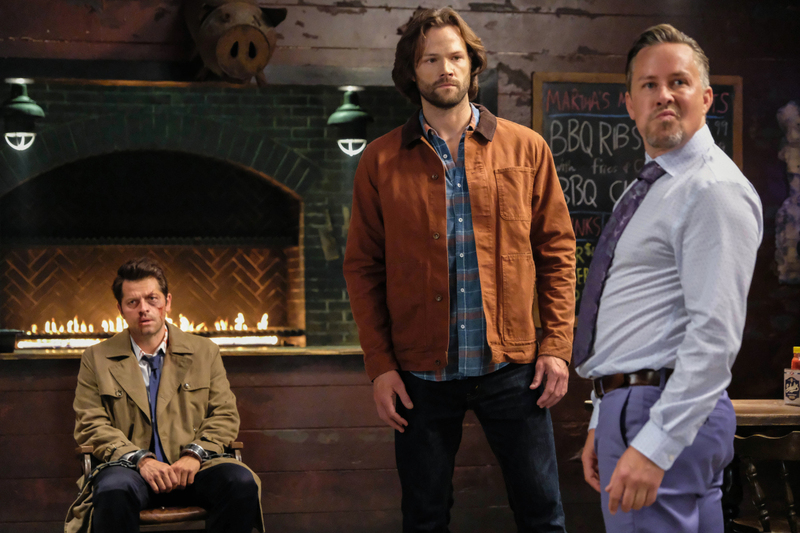 It feels a bit like the beginning of season six when Dean was living with Lisa and Ben, and Sam was soulless and off doing strange things with the Campbells. And Michael's delusions of godhood remind me a bit about when Castiel got to be God, way back in… what season was it? Seven. Geez. But the supporting cast continues to be awesome. It's fun that the homeless soldiers from Apocalypse World all seem to be living in the bunker. (At least it's not a small bunker, and hosting a supernatural SWAT team is a Men of Letters raison d'etre, n'est-ce pas?) It is especially nice to have Bobby around again even if he's a different Bobby, and interesting, not to mention wonderful, that while Mary's forced optimism is striking Sam the wrong way, she seems to be bonding with Bobby over beers in the kitchen. Is it too much to ask the Supernaturalverse for Mary and Bobby to stay alive and possibly even get together? I'm also pleased that Jack survived season thirteen even though it was without his grace, and it was sweet how nearly everyone made a point of trying to make him feel needed. After all, he is most certainly getting punched in the face just like the rest of them. And his grace will return. Won't it? I don't know, maybe it won't. We all know that there are plot problems with beings that are too powerful. Finally, how about that reveal that Lucifer's vessel Nick is still alive, poor guy? I never expected that to happen. Unfortunately, The CW ran a commercial for the upcoming Halloween movie that featured Sam talking to Nick, and it ran before the actual Sam/Nick scene, ruining the surprise. Spoilers, guys! — Title musings: "Stranger in a Strange Land" is originally a biblical quote from the book of Exodus, but it's also the title of a classic science fiction novel by the great Robert A. Heinlein about the second coming. And in that novel, the new Jesus is named Michael. How about that? — All through this episode, I kept thinking of what Dean said about being an angel condom. 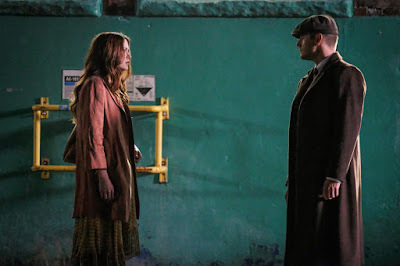 — Ketch, whom we didn't see, was in the UK failing to find a Newton-Dee Hyperbolic Pulse Generator, the magic egg that kicked Lucifer out of the president. — Continuity question: can't Castiel see the real demon faces under the human faces? Why didn't he know the bar was full of demons? — Nick's bed was centered inside a devil's trap. If Lucifer is dead, and I hope he is, why would they do that? — Resurrected Maggie had a somewhat prominent role here as a medic and as a warrior. Not a hacker, though. They need Charlie. Although I wonder if Apocalypse World Charlie is a hacker? — I'm enjoying the fact that Jensen Ackles got to do scenes with his real life wife, Danneel. That had to be fun for them. I like her Instagram account. — This week: Detroit, Duluth, a few other random locations with Michael, and of course, the bunker. — In this week's hair report, did Jack get a new do? He looked really good, even though he was powerless. — Why are jokes about Castiel's relationship with the Winchesters so funny? Discuss. Bobby: "As a wise man once said, it ain't how hard you hit, it's how hard you can get hit and keep moving forward." Jack: (not joking) "Was that Gandhi?" Bobby: "Probably. Yes. Something like that." Castiel: "Does any demon know where Dean Winchester is?" Kip: "I'm sorry, did you just say that you lost a Winchester? Because one, that's… interesting. And two, how is it that you lost Dean? I thought the two of you were joined at the… you know, everything?" Kip: "Sure I can't get you anything hot and black?" Castiel: "Coffee has no effect on me." Kip: "Me either. You know, not anymore. But it's like saltwater taffy or infants, you know, I just like the taste." For what it's worth, I grew up in the Atlantic City area and I utterly despise saltwater taffy. Kip: "I have heard so much about you. You are a damn legend, Sam, an icon. The shoulders, the hair! Mmm! You are my Beyoncé." Sam: "If it meant finding Dean, I'd... work with... I'd do anything." I thought it was pretty good. Maybe a few too many callbacks to previous seasons, which you mentioned. I especially like the Peaky Blinders wardrobe. I liked the new episode too, and I really liked getting to see the angelic true form thing. I didn't realize how much I'd miss the brothers working together, though. I want Dean back soon, but we're probably not going to get him back until the midseason finale or something. Didn't like the new title card, though. It just felt really cartoony compared with the translucence? luminescence? of earlier seasons? I don't know if I'm making sense, but the more concrete CGI just felt strange. Dragonfire, you have a good point about the title card. Maybe it's the disembodied blue wings. They've done wings before but this time, it doesn't feel like it works. It reminds me of the Scoobynatural title card a lot, with that sort of hand-drawn animation/cartoonish feel to it. Which, great episode, but that style doesn't work with the previous feel of the title cards, the feel of the show, and the feel of the episode. I think s9 did it better, TBH. 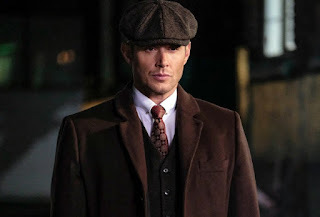 I'm just going to say what we're all thinking - I really want Dean to keep the hat. I felt totally the same way about the title card. I think it's because it's a solid representational image, whereas they usually go for evocative metaphor imagery. I might have overthought that. Mikey, a hint -- it was a day of the week. I think they put his bed in the Devil's Trap just in case it's really Lucifer playing possum while his grace regenerates. He pretended to be weaker or stronger than he really was on multiple occasions last season so it's not outside of reason to think he would pretend to be Nick after Earth 2 Michael speared him. But really I'm hoping it's really Nick. Mark Pellegrino is fantastic but I'm tired of Luci being trouted out as the big bad, particularly as he hasn't really been scare in years.